See what you can enjoy at UNCG’s Weatherspoon Auditorium in the next two months. Have relatives or friends visiting for the holidays? The Weatherspoon’s a perfect destination. Free admission. Free parking. Free thinking. This year UNCG will send at least three scholars – the campus’s largest number yet for a single application period – to the Folger Institute at the Folger Shakespeare Library in Washington, D.C. The institute is a premier location for collaborative and investigative research in the arts and humanities, and the library holds the largest collection of Shakespearean materials in the world, with artifacts from the 13th to the 18th century, and a Renaissance-style theater. Over the past six years, UNCG has sent scholars from the departments of English, History, Language, Literature, and Cultures and Art, with the applicants consistently placing in the top third in rankings from the Folger’s applications review committee, averaging far above the mean selection rate for the Folger Institute’s 46 schools, notes UNCG Folger campus representative Dr. Christopher Hodgkins, professor of English. Assistant Professor of English Dr. Jennifer Park will participate in Reid Barbour’s Folger spring seminar “After the Great Instauration” with an eye on scientific knowledge in the 17th century. Her in-progress book, “Vital Preservation: Experiments in Immortality in Early Modern Drama,” investigates early modern experimentation in science and medicine in relation to living bodies and the quest for immortality. Through attending the seminar and by examining the Folger materials, Park will prepare a future graduate-level course in the history of science and the materiality of the text in early modern literature. Lecturer in English Dr. Lauren Shook, who also studied at the Folger Institute in 2013-14, will return to participate in the seminar “Shakespeare’s Virtues: Ethics, Entertainment, and Education” directed by Julia Reinhard Lupton. With her UNCG students, Shook has analyzed Shakespeare’s portrayals of dining, hospitality, food cultures and culinary metaphors, connecting them to food insecurity in early modern England and in the United States presently. Through her upcoming Folger seminar, Shook plans to amplify the material of her own course “Dining with Shakespeare,” and the scope of her research project, “A Place at Shakespeare’s Table.” The project combines her interests in food access, hospitality, civic democracy, and service-learning, advocating for a service-learning approach to Shakespeare’s culinary worlds. Shook looks forward to learning from fellow Shakespeare scholars to the opportunity to access the Folger’s extensive collection of cookery books and manuscripts. English Ph.D student Crystal Matey will also participate in the spring seminar, “After the Great Instauration.” Matey’s research focuses on experimental philosophy in the Restoration, as well as the history of science and its impact on literature. In her scholarship, she explores how speculative writing from that period articulates the questions and anxieties that accompanied the institutionalization of science. Attending the seminar at the Folger Institute will allow her to continue her examination of Francis Bacon’s work and other philosophies that influenced perceptions of science and how early modern dictionaries contributed to the popularization of “scientific” knowledge. UNCG’s Folger Institute membership is supported by Dr. Terri Shelton, vice chancellor for Research and Engagement, and Dr. John Kiss, dean of the College of Arts and Sciences. Dr. L. DiAnne Borders (Counseling and Educational Development) received the Lifetime Achievement Award during the recent annual conference of the Association of Counselor Education and Supervision in Chicago . Dr. Borders was honored for her 30 years of research, scholarship, teaching/training and advocacy for clinical supervision. She currently serves as the editor-in-chief for The Clinical Supervisor, the only international and interdisciplinary journal for research on clinical supervision education and practice. She has written many articles on the topic, as well as two text books. Nominators and testimonials speak to the impact Borders’ work has on many lives – and the ripple effect her personal teaching and published has had and will continue to have. Borders, who is a UNCG alumna (BA, English), joined the UNCG faculty in 1987. She is Burlington Industries Excellence Professor in the School of Education’s CED program, which is rated among the top four such programs in the nation by U.S. News and World Report. It’s no secret that controlling cholesterol levels helps ward off cardiovascular disease, particularly the build-up of plaque inside arteries. But you might not know it’s equally important to control inflammation in blood vessels. Identifying the best ways to do so can have significant clinical implications. Current treatments require steroids and non-steroidal anti-inflammatory medications, which can produce negative side effects. That’s where Associate Professor of Biology Zhenquan Jia comes in. With National Institutes of Health funding, he’s investigating whether it’s possible to control tumor necrosis factor-alpha (TNF-α), a cytokine that increases the number of white blood cells that stick to inner blood vessel linings, contributing to inflammation. Answering this question is important, he says, because atherosclerosis — the hardening and narrowing of blood vessels — contributes to heart disease, the leading cause of death in the United States. To search for answers, Dr. Jia is investigating two substances. First, he researched genistein, a plant-derived compound common in foods found in Asian diets, such as soybeans. He has demonstrated, via mouse-model experiments, that genistein reduces TNF-α activity, making the natural compound a candidate to combat vascular inflammation. Jia also found that genistein reduces production of other cytokines that impact how strongly TNF-α influences white blood cell activity. His next target is a nano-technological strategy to combat vascular inflammation — carbon nanoparticles, called Cdots or carbon dots. Cdots, smaller than 10 nanometers, are an attractive option, he says, because they have low toxicity, can be produced in an environmentally friendly way, and don’t appear to cause negative side effects. Jia, a toxicologist, initially launched his investigation into Cdots — considered the next “big thing” in nanopharmacology — to see if they would detrimentally affect human health. He was surprised to discover the opposite. In testing Cdots on human umbilical blood vessel linings, he found that Cdots, like genistein, can reduce the number of white blood cells that stick to blood vessel linings. “These results suggest there’s potential for an anti-inflammatory action against vascular dysfunction,” he says. Cdots also offer a second benefit. Jia found they reduce the production of reactive oxidative species, or ROS. Reactive oxidative species, the natural byproduct of oxygen metabolism in the body, ordinarily play a positive role in maintaining the body’s inner balance. But some studies, Jia says, show the body overproduces ROS during times of stress, leading to inflammation and, ultimately, contributing to atherosclerosis. Based on his preliminary results, Jia has netted a prestigious NIH R15 grant to expand his exploration of Cdots. He hopes using nanotechnology to combat America’s leading killer at the molecular level will reveal new options for patient treatment. “I believe Cdots will pave the way for a new treatment and prevention avenue for patients who face atherosclerosis,” he says. “Healthy Vessels” by Whitney J. Palmer originally appeared in the spring 2017 UNCG Research Magazine. Ask any Spartan about their UNCG experience, and they’ll tell you that it’s all about the people. It’s the relationships that make this place special – the professor who encourages a student to submit her paper to a conference or the staff member who counsels a struggling freshman. The UNCG Now web site has begun a series focusing on many faculty and staff – and Cech is the first to be spotlighted. The web and video series at the site will highlight some people who help shape the UNCG experience for so many students – the faculty and staff that challenge and inspire Spartans. The first spotlight is Dr. Nadja Cech, Patricia A. Sullivan Distinguished Professor of Chemistry. Cech’s passions encompass teaching and mentoring students and working with medicinal plants and fungi to find new ways to treat drug-resistant bacterial infections. Over the last 10 years, Cech’s collaborative research program has received more than $6 million in external funding from organizations like the National Institutes of Health and the National Science Foundation. Yet her internationally recognized research has humble beginnings – it was running barefoot on her family farm in Oregon when Cech started to explore how plants could be used as medicines. A few years later, as a student at community college, she had the opportunity to participate in research for the very first time. That excitement can still be seen today in Cech’s lab, where she and her 14 students work to find molecules from plants or fungi that could be used to develop new pharmaceutical drugs. Her team, Cech Research Group, includes freshman chemistry majors all the way up to PhD candidates. It’s this unique mix that makes the group so successful. Cech is deeply committed to supporting diversity and inclusion in her research. Often, that means intentionally seeking out students from underrepresented populations who may not know about research opportunities on campus. She also serves as a mentor to female scientists. Currently, Cech advises five PhD students – all are young women, and many came to UNCG specifically to be mentored by Cech, who helped establish the PhD in Medicinal Biochemistry program in 2008. Why UNCG? For Cech, who first arrived on campus in 2001, it’s the students that distinguish the university. See full story – and a great student geared for students and prospective students – at UNCG Now. UNCG was chosen as a Lead Consulting Institution for the 2017-2018 year. The Office of Leadership and Service-Learning is now serving as a mentor institution in civic learning and democratic engagement for other lead-designated institutions throughout the country. NASPA’s (Student Affairs Administrators in Higher Education) Lead Initiative on Civic Learning and Democratic Engagement comprises a network of 96 NASPA-member colleges and universities committed to encouraging and highlighting the work of student affairs in making civic learning and democratic engagement a part of every student’s college education. The Lead Initiative offers unique professional development opportunities, targeted resources, networking, and recognition for its Lead Institutions. Lead Consulting Institutions (LCIs) act as mentors, supports and resources for other Lead Institutions. For example, UNCG leads a conference call each month with staff at six cohort universities, such as University of Texas-Austin and Florida International. Consulting institutions such as UNCG are called upon for their expertise and serve as leaders in helping NASPA staff create and execute strategy, programming and content for the initiative moving forward. For their work, LCIs will receive tailored and unique professional development experiences, publication and writing opportunities, and the chance to influence the ways in which student affairs contributes to the civic learning and democratic engagement field. The Graduate School recently presented the inaugural awards for the Outstanding Director of Graduate Study and the Outstanding Administrative Assistant at this semester’s Directors of Graduate Study (DGS) luncheon. These two awards will now be presented annually to one faculty member and one staff member who have demonstrated outstanding work in their roles while working alongside the Graduate School staff and administrators. 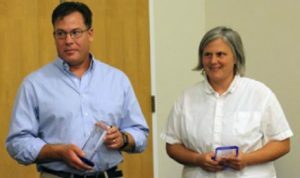 Dr. Paul Steimle, the Director of Graduate Study in the Department of Biology, was selected as the recipient of the Outstanding Director of Graduate Study Award and Janeen Chastain, from the Department of Peace and Conflict Studies, was selected as the recipient of the Outstanding Administrative Assistant Award for the 2016-17 academic year. These recipients have set a high standard for the future recipients and represent the very best of UNCG’s efforts on behalf of its graduate students. Award recipients for the 2017-18 academic year will be selected during the spring 2018 semester. Wednesday, Nov. 1, Faculty Senate meets in the Virginia Dare Room, Alumni House at 3 p.m. Faculty Senate Chair Andrea Hunter will give opening remarks. Provost and Executive Vice Chancellor Dana Dunn will give remarks regarding Strategic Plan metrics. At 3:40 p.m., Anna Marshall-Baker, Lead of UNCG Faculty Assembly Delegates, will present the UNC Faculty Assembly Report. Subsequently, University Counsel Jerry Blakemore will present on Academic Freedom and Freedom of Speech. At 4:30 Prashant Palvia, Liaison to the Budget Committee, will present on the Budget Committee Website. Andrea Hunter and Anne Wallace, Immediate Past Chair will present the Faculty Senate Self-Study. Announcements and Adjournment will follow. The next Faculty Forum is Wednesday, Nov. 15, at 3 p.m., in the EUC, Alexander Room. The next meeting of the Faculty Senate will be Wednesday, Jan. 10, in the Alumni House, Virginia Dare Room. The Elliott University Center will host its second Red Cross Blood Drive of the academic year on Wednesday, Nov. 15, from 8:30 a.m. to 6:30 p.m. in Cone Ballroom. Schedule your donation appointment today and help the EUC reach its 300-pint goal. For those wishing to donate double red blood cells, the Red Cross is currently accepting only blood types A negative, B negative, O positive and O negative. Make an impact for charity of your choice, through SECC. Some will win great prizes. How much of a difference can your SECC contribution make? Over 20 non-profit organizations were on hand for the annual UNCG State Employees Combined Campaign (SECC) Kick-off and Agency Fair on Oct. 23 to tell faculty and staff just how much. The SECC, the official annual giving campaign for state employees, strengthens North Carolina communities through the near thousand charitable organizations in the state it supports. Donations are essential to their success, as state employees and retirees contribute to the many organizations that better the quality of life in communities. Stephen Hartley, developmental associate for Operation Smile, sees firsthand how much of an impact donations can make. For Piedmont Land Conservancy, an organization that works in nine counties to preserve open spaces, being a part of SECC has helped bring awareness to its mission. “We can protect more land throughout the Northern Piedmont when people donate,” says Lynne Dardanell, communications and outreach manager. Other organizations such as the Homeschool Foundation, which aids families with homeschooling and those that are struggling financially, also appreciate the help. “It means more than words can express,” says Community Ambassador Michelle Vantrease. The campaign has officially begun and SECC envelopes have arrived in each employee’s mailbox. The full list of organizations (you can choose one or more) are listed at ncsecc.org. New this year: Each week, all employees who pledge by noon on Fridays (through Nov. 17) will be entered into a drawing for a chance to win a great prize. You will remain in the “prize pool” unless you have previously won this year. For questions about the weekly drawings, please contact Jana Walser-Smith (jfwalser@uncg.edu). For more information on how to give, visit secc.wp.uncg.edu/give-now. This Thursday at 6 p.m. and Friday at 3:30 p.m., the departments of Geography and Economics and the Environmental and Sustainability Studies Program will sponsor two sessions, open to the community, on sustainable transportation and alternative fuels. The events will be directed by Dr. Michael Kuby, Professor in the School of Geographical Sciences and Urban Planning at Arizona State University, where he is also Director of the Interdisciplinary Graduate Certificate in Transportation Systems and a Senior Sustainability Scientist in the Global Institute of Sustainability. In the Thursday, Nov. 2, workshop, Dr. Kuby will introduce a collaborative, participatory “geodesign” approach to planning a regional network of fuel stations for alternative-fuel vehicles. Participants will use an intuitive, interactive, online mapping platform to visualize and evaluate a system of station locations. The Friday, Nov. 3, presentation, “Sustainable Transportation for the 86%: Location Models and Survey Research for Planning Alternative-Fuel Station Infrastructure,” will review recent work on the planning of fuel-station networks designed for different vehicle types, geographic scales, driver perceptions, preferences and spatial behaviors: where do drivers refuel or recharge, and how do they evaluate the adequacy of the infrastructure when deciding whether to purchase a particular vehicle. Both events are in Graham 106. Confirmations of attendance can be emailed to dmhaller@uncg.edu. Parking in Lot 7 (behind the Graham building) will be free after 5 p.m. on Thursday, Nov. 2. “Etty,”a one-woman play adapted and performed by Susan Stein will come to UNCG Wednesday, Nov. 8, at 7 p.m. The play is based on the letters and diaries of Etty Hillesum, a Dutch Jewish Woman who witnessed the Nazi occupation of Holland and was killed in the Auschwitz concentration camp at age 29. The intimate portrait of a young woman during the Holocaust has direct relevance to a wide range of academic disciplines. Stein is an experienced educator and will be available to visit classes, interact with groups of students or faculty and participate in panel discussions on Nov. 7 and Nov. 8. Please contact Roy Schwartzman at doc_roy@uncg.edu to schedule her for a class, gathering or meeting. The performance, in Ferguson 100, is free and open to the community. Free parking is available in Lot 7 behind the Graham Building in “C” permit spaces. For more information about the production, visit the website. Kathleen (Kathy) Baber has been named director of UNCG Student Health Services (SHS). Kathy joined UNCG Student Health Services in January, 2015, and has served as interim director for over a year. She brings to the role over 27 years of healthcare experience in hospital and medical practice administration. Her most recent experience prior to UNCG was twelve (12) years as executive director of Regional Physicians, a multi-specialty physician group owned by High Point Regional Health System with over twenty locations. As SHS director, she is responsible for providing strategic leadership and direction for all Student Health Services operations, including the Counseling Center, Medical Clinic, Women’s Health, Immunizations, Pharmacy, Lab/X-Ray, IT, Health Information Management, Billing/Insurance, and the Spartan Recovery Program. She has a bachelor of arts degree in sociology from Henderson State University and a master’s degree in business administration from the University of Arkansas at Little Rock. She also serves as UNCG HIPAA privacy officer, chairs the campus HIPAA Committee and Communicable Disease Committee, and is part of the UNCG Emergency Preparedness and Response Team (EPART). She may be reached at kababer@uncg.edu or (336) 334-3147. The International & Global Studies Program “Global Spotlights” series is featuring international political topics in the news. The next talk is Nov. 13 at 5 p.m. and will focus on US-North Korean relations. Titled “Bargaining and Brinksmanship: The U.S. and North Korea in 2017,” the talk by Dr. Linda Brady (Political Science) will be Nov. 13, 5 p.m., Moore HRA, Room 1215. The series is sponsored by IGS, the Global Engagement QEP, and the University Libraries. Light refreshments will be provided. For disability accommodations, contact Yvonne Matlosz at ylmatlos@uncg.edu. This Friday, Nov. 3, the Housing Hangout will be on the topic of Housing Innovations, and the conversation will be at noon in Moore HRA, Room 1607. Visiting Associate Professor of interior architecture Maruja Torres will be joined by two graduate students, who will make presentations. Jessica Ocasio will discuss the Tiny Home Movement and how tiny homes can be an affordable housing choice for young professionals, and Emily-Kate Hannapel will discuss innovative uses for older mobile homes. Housing Hangouts are informal gatherings for students, faculty, researchers, community agencies and governmental representatives from local, regional and state agencies to discuss housing and community development issues. Dr. John Z. Kiss (Dean, College of Arts and Sciences & Professor of Biology) received the Founder’s Award from the American Society for Gravitational and Space Research (ASGSR). This is the highest award presented by the society, given for lifelong contributions to gravitational and space biology. He received the award last Saturday at the association’s 33rd annual meeting, in Seattle. Chancellor Franklin D. Gilliam, Jr. has been named one of the Triad Business Journal’s 2017 Power Players. The journal notes that in the past year, the chancellor has announced plans for a two-part Millennial Campus, one focused on health and wellness, and one focused on the visual and performing arts. View the Triad Business Journal page here. UNCG’s annual giving campaign – the SECC – is underway. A complimentary luncheon for faculty and staff kicked things off Monday in the EUC. The Spartan Cheerleaders led the cheers at noon – and then SECC Chair Macea Whisetts led an SECC chant. Over the last 30 years, UNCG has raised $3,700,000 to support charities locally and abroad through the State Employees Combined Campaign (SECC), she noted. That’s something to make some noise about. Last year, an impressive 38 percent of UNCG employees contributed. This year, the goal is 45 percent participation, she said. Provost Dana Dunn spoke, encouraging everyone to give what they can. With charitable organizations on hand to share info on the impact they make …. and the SECC Pop Up Shop (which netted $350 for the SECC) … and the announcement of giveaways in the weeks ahead … and UNCG faculty (Music’s James Douglass with Fabian Lopez) providing wonderful music for the lunchtime gathering … plus the hotdogs, soft drinks and cake …. it was reminiscent of SECC Kickoff luncheons of much earlier years. Casaundra Maimone spoke about therapy dogs – the impact gifts and work can have, even when they’re not evident at the time. This year, the campus is having its first SECC T-shirt Fundraiser. To order, visit this link. This Monday morning, enjoy the Pancake Breakfast / Silent Auction (Community Fundraiser). It will be held Oct. 30, 7-9 a.m., Fountain View Dining Room, Moran Commons. Tickets are $6 each. All proceeds will be donated to the SECC. This event is open to the public. The guests will receive free parking in the Oakland Deck. Purchase Tickets for the Pancake Breakfast here – or visit the Spartan Business Center (located downstairs in Moran Commons). More info at secc.uncg.edu. To participate, fill out the form you received in your department and return it to the department’s SECC facilitator – or see how to to donate online here. Friday, Oct. 27, at 7 p.m., UNCG’s main street becomes Halloweentown for students, with yard games, bungee trampoline, personalized rings, candy apples, raffles and more. Every year, Ashby Residential College (in Mary Foust Residence Hall) creates a large-scale, creative haunted house experience, open to campus and the public. This year’s “House of Torment” is Saturday, Oct. 28, from 7 p.m. to midnight, in Mary Foust, 301 College Avenue. Admission is $5 per person, or $3 with a canned food item. All proceeds benefit The ARC of Greensboro and the Spartan Pantry. See the Campus Weekly (link to) story for more details on the Haunted House’s 22-year history. The UNCG Organ Studio will present its annual Halloween organ recital, “Spooktacular,” Monday, Oct. 30, at 7:30 p.m. in the Music Building’s Organ Hall. The theme this year is “Bells, Birds and Beasts,” and the performance will include costumes and pumpkin carols with the audience. The concert is open to the community and admission is free. Digital Media Commons, UNCG Libraries and the Digital Acts Studio (Action, Consultation, and Training) will hold an open house to celebrate the studio’s five-year anniversary, and the house is haunted. It will feature a Zombie VR experience, a Haunted Greenscreen Photobooth, a Spooky Special Effects mini-workshop in DACTS, Scary 3D print giveaways and free food. UNCG Staff Senate will collect donations of costumes and candy through Friday, October 27. The candy will be handed out to neighborhood trick or treaters at Spartan Village. The costumes will be distributed via a local church to trick or treaters who don’t have Halloween costume money in their budgets this year. Contact Janeen Chastain (jkchast2@uncg.edu) or drop then off at 1510 Walker Ave, Room 418. When it comes to business, Dr. Cheryl Nakata is all about the soft side. “The best organizations that truly have innovative cultures account for the whole of people and how they work together,” said Nakata, UNCG’s new Joseph M. Bryan Distinguished Professor of Innovation. Nakata, who joined UNCG this summer, teaches innovation in the Marketing, Entrepreneurship, Hospitality, and Tourism Department of the Joseph M. Bryan School of Business and Economics. With very few universities offering a professorship in innovation, UNCG provides a unique opportunity for innovation to impact its students, faculty and communities. “The Bryan School wanted to make innovation a pillar of the entire business school in research, teaching and outreach,” she said. The Bryan School’s diverse student population was another draw, as well as the emphasis on a clear, strategic vision. Prior to her appointment at UNCG, Nakata was professor of marketing and international business and department head of managerial studies at the University of Illinois at Chicago. She has a master’s in management from Northwestern University and PhD in business administration from the University of Illinois at Chicago. She has been recognized for her teaching with the Honors College Fellow of the Year as well as Favorite MBA Professor of the Year awards from the University of Illinois. Before entering academia, Nakata worked for several years in managerial and analytical positions in the U.S. and China, as well as started and operated her own international business consultancy. She provided marketing research services in over 40 countries to Fortune 500 corporations to expand their global reach. She was a marketing researcher at General Mills in Minneapolis and Kraft in Chicago, and she lived and worked in China as head of business intelligence at a joint venture. As part of her holistic and integrated approach, Nakata brings a broadened vision of innovation to UNCG – what she calls the “soft skills”: thinking, attitude, openness, relating and well-being. You can have the best technology to do the work of business, she added, but you also need people who know themselves and can know others in ways that build off of each other’s strengths. “And realize the process of innovating is uncertain, messy and ripe for failure, but failure is OK in this approach,” she said. Tapping into deeper human capacities in order to create a more thoughtful and generative innovation culture is Nakata’s interest – and she’s well aware that this human-centered language isn’t commonly heard or used in business schools. At the Bryan School, Nakata said she will work with other faculty to add another foundational layer of these kinds of skills, abilities and mindsets to the innovation curricula for students. “It’s a dinner party that goes wrong,” said sophomore Carrie Jester, artistic director of this year’s haunted house in Mary Foust Residence Hall. The one-night production is created by the Ashby Residential College students and goes up this Saturday at 7 p.m. The Mary Foust Haunted House first took place in 1995, at the initiative of two students, Andrea Davis and Ryan Harrison. They pitched the idea to “Fousters” as an event to raise money for a local nonprofit, and it was a go. Now, the Mary Foust Haunted House is a major production created by 60 or more students, and it has always supported service organizations with 100 percent of the proceeds generated. This year’s proceeds will go to the Arc of Greensboro and the Spartan Open Pantry. Each year, the house has a theme that drives the creative process. She likes seeing students growing as a team as they develop their artistic skills during the fall semester. “They get to see something from the idea stage to the completion stage, planning each step of the way and then seeing the final product,” she said. But what does she think of the final product? Residential College Coordinator Will Dodson, who has supervised the haunted house student leadership for the past 7 years, says the process is not only a lot of fun, but it gives the students hands-on artistic experience. This year’s “House of Torment,” is Saturday, Oct. 28, from 7 p.m. to midnight, in Mary Foust Residence Hall, 301 College Avenue. Admission is $5 per person, or $3 with a canned food item. Before entering, visitors can also enjoy concessions, games and old movies. UNCG and UNC Wilmington collaborated on a full-scale hurricane evacuation and sheltering exercise on the UNCG campus Oct. 16 and 17. The exercise, called “Hurricane Zephyr,” was designed to educate and prepare students, faculty and staff in the event of an evacuation. The exercise simulated the actual procedures and communications that would take place in the event of a real storm with catastrophic potential. Evaluators from the Federal Emergency Management Agency (FEMA) were on campus to observe the exercise and provide recommendations to enhance emergency plans and coordination among the UNC campuses. Representatives from the American Red Cross were also involved in the exercise, providing shelter guidance and real-time shelter training to UNCG staff. The full-scale exercise covered all aspects of evacuation protocol: from an evacuation order at UNCW to setting up and operating a shelter site in UNCG’s Coleman Practice Gymnasium. The drill involved 30 faculty, staff and administrators from UNCG, representing 10 different university departments. A larger exercise is planned for the winter. *Please obtain approval from the nominee before submitting their information. All information provided will be kept confidential. Undergraduate Admissions will host its annual fall open house for high school juniors and seniors Saturday, Oct. 28. The event attracts approximately 1,400 visitors from across North Carolina and beyond to campus, including more than 500 high school students interested in learning more about UNCG as a prospective college choice. Spartan Showcase is an opportunity for prospective students and their families to experience UNCG first-hand, including talking with faculty and current students about academics and getting a feel for campus through tours and visits to a residence hall, dining hall and rec center. Students also can learn about financial aid and ask any questions about the admission and enrollment process. Hundreds of faculty and staff from across campus participate in Spartan Showcase, and academics are an essential program component. To give prospective students better insight into department and program offerings, this year guests will visit academic units in their own spaces. This approach should allow prospective students an authentic classroom experience in the major of choice and speak directly with faculty and current students about what distinguishes UNCG from other institutions, said Chris Keller, director of Undergraduate Admissions. Spartan Showcase also includes an invitation-only reception for high-achieving prospective students to highlight UNCG opportunities for students who crave an especially challenging college experience. The Programs of Distinction reception will feature faculty and student speakers and will highlight the Lloyd International Honors College, UNCG’s innovative residential colleges, and opportunities for undergraduate research and study abroad. This November, UNCG will again be celebrating global engagement by participating in the 17th annual International Education Week (IEW). IEW, on Nov. 13-17, is a joint venture of the US departments of State and Education, which celebrates international exchange students and global education. The event is important in developing mutual understanding and respect, building global leadership, and investing in future relations between the US and people from around the world. All week, UNCG’s International Programs Center will be tabling from 11 a.m-2 p.m. in the EUC commons. They will hand out country buttons and provide information on the IEW events. The IPC is again hosting the International Photo Contest, and for the first time UNCG faculty who have traveled abroad for UNCG-related programs can enter. Photos can be entered until Oct. 31. During IEW, the photos will be displayed for voting in the OIE, with the winners announced on Nov. 16. Tuesday, Nov. 14, 2-5 p.m., a Staff/Faculty Intercultural Sensitivity Workshop will be held. More information on this workshop can be found through HR’s event calendar. All UNCG employees interested in developing their intercultural competency are welcome. There will also be the Hosting J-1 Scholar Workshop, which discusses hosting colleagues from abroad at UNCG. Both of these workshops require RSVP. From 11:15 a.m.-1:45 p.m., the ChirbaChirba Dumpling food truck will be at the back entrance of the EUC serving IEW attendees. The IEW Cultural Fest & Global Connection Fair, the central event of the week, will be held Thursday, Nov. 16, at the EUC Auditorium from 2-4:30 p.m. There will be free food, performances by four world music groups, and the announcement of the IPC Photo Contest winners. More information, a complete list of events and Photo Contest entry info can be found at the IPC website. For any questions, or to RSVP for events, please email isssga2@uncg.edu. Learn more about safety resources at UNCG. The UNCG Environmental Health and Safety Department will sponsor the first-ever “Spartan Safety Week” November 6-10, 2017. Monday, November 6 – EH&S Chemical Safety Facility Open House, 724 Stirling Ave. – Corner of Oakland & Stirling, 11 am -2 pm. Enjoy complimentary food. Friday November 10 – Dr. Scott Geller, Keynote Address and Book Signing – 10-11 am EUC Auditorium Visit http://www.safetyperformance.com/. A YouTube video of a TedTalk by Dr. Geller may be viewed here. Visit www.safetyuncg.edu for full information. Open Enrollment will be held through October 31, 2017. Here are a few of the State Health Plan changes for coverage beginning January 1, 2018. MUST TAKE ACTION to choose the 80/20 Plan and/or to reduce their premium. Consumer-Directed Health Plan (CHDP) is no longer available. The only Wellness Premium Credit activity is the Tobacco Attestation. Active members in the 70/30 Plan and 80/20 Plan may reduce the monthly premium by $60 each month by attesting to being tobacco-free, or committing to enroll in the QuitlineNC multiple-call program by the end of Open Enrollment. Click HERE for details. The Flexible Spending Accounts (FSAs) require re-enrollment every year. If you want to participate in either or both of the FSAs, you must make your election during Open Enrollment. Effective for the 2018 plan year, any unused Health Care FSA funds up to $500 can now be rolled over into the 2019 plan year, as long as you have a minimum balance of $25. Beginning in January 2018 , you can use the NCFlex Convenience Card to pay for eligible dependent care expenses, up to the amount available in your account. Premiums for the Dental High Option will be lower in 2018. EyeMed Vision Care replaces Superior Vision as the new vision vendor, offering a larger network of providers and lower premiums for 2018. Under V ision coverage, the Enhanced Plan will have a higher frame allowance of $200 and contact lens allowance of $175. New Accident Insurance will be offered through NCFlex. Click HERE to access an electronic version of the NCFlex Enrollment Guide. If you participated in Open Enrollment last year, you may have experienced problems logging into the insurance website. UNCG Human Resources and Information Technology Services are excited to announce Single Sign-On for this Open Enrollment! You will be able to log in using your UNCG username and password. For Single Sign-On access click HERE. Open Enrollment Assistance Labs – Join our HR Benefits Staff in the computer lab as we walk you through the 2018 enrollment process. Staff will be on hand to provide assistance for online enrollment of your 2018 benefits and to answer any questions you may have. Register for a seat in the 2018 Open Enrollment Assistance Lab by clicking HERE. Please contact HR Benefits at (336) 334-5009 or askbenefits@uncg.edu if you have questions. UNCG is beautiful. And UNCG volunteers will join in making Peabody Park even more healthy and attractive. On Friday, Nov. 3, from 1-3 p.m., the Peabody Preservation Committee will host its 10th anniversary fall Ivy Pull event. The occasion will serve as a time to remove invasive species from the woods, while also increasing diversity by planting native species such as shrubs and herbs. For the past 20 years, the UNCG Peabody Park Preservation Committee has worked with members of the community to restore the Peabody Park Woods on campus. Recipient of the Greensboro Beautiful Annual Service Award for “year-round excellence in environmental education and campus beautification”, the committee works to educate the community and help maintain safety in the woods. The Ivy Pull is a popular event, and is limited to around 70 students, faculty, and staff. Come join the effort. Volunteers are advised to wear old clothes, long pants, and closed-toe shoes. Important items and electronics should also be left at home. Participants will meet at the south entrance of the woods, at the north end of College Ave.
For more information, visit the Peabody Preservation Committee’s website at https://peabodypark.uncg.edu/. Questions? Email eplacey@uncg.edu. Visuals: Photo from an earlier “ivy pull” event. On Oct. 6, Provost Dana Dunn sponsored a luncheon meeting in the Virginia Dare Room to launch UNCG’s new Association of Retired Faculty (ARF), which was attended by 42 retired and current faculty. In addition to a welcome by Vice Provost Alan Boyette and presentations on the purpose and background of ARF by Spoma Jovanovic and Pam Williamson, participants heard plans for development of ARF’s bylaws from University Deputy General Counsel Michael Jung and Stephen Yarbrough. Featured were presentations by Catherine Frank, Executive Director of UNC Ashville Osher Lifelong Learning Institute, and Art Cooper, NCSU ARF Past President. Advocate for the University to individuals and entities beyond the University. Current members of the UNCGARF Organizing Committee include DiAnne Borders (CED), Susan Dennison (SWK, retired), Diane Gill (KIN), Spoma Jovanovic (CST), Betsy Lindsey (SWK, on phased retirement), Vicki McCready (CSD, retired), and Stephen Yarbrough (ENG). Prior to the luncheon, Pam Williamson (SES) chaired the Committee, surveyed faculty, and sponsored focus groups during her tenure as Provost’s Faculty Fellow for 2016-2017. The next meeting of ARF will be a wine and cheese reception on Thursday, Jan. 25, 2018, from 5-7 p.m., in the Virginia Dare Room. For more information, contact Susan Dennison at stdennis@uncg.edu.